Egypt discovers 16 huge right hand skeletons confirming the legend of "changing hands for gold"
On November 25th, according to media reports, archaeologists dug four pits under a palace in the ancient city of Avaris in the Nile Delta. 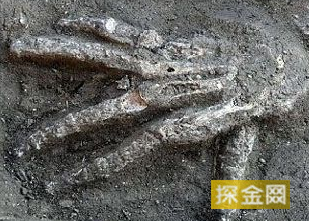 They found 16 giant human right hands belonging to about 3,600 years ago. Bones confirmed the ancient legend of Egyptian soldiers who had been â€œchanging their hands for goldâ€. It is reported that ancient Egypt has always had the legend that soldiers defeated the enemy and cut the enemyâ€™s right hand in return for gold, but it has not been confirmed. The archeologists unearthed 16 human right-handed skeletons. They believe that this is the only evidence that the Egyptian warriors have so far "discussed for gold". The Australian archaeologist Manfred Bietak stated: â€œThese palms look very large, and some can even be described as huge.â€ According to preliminary inferences, these excavated objects are relics of the Greek Hyacinth Dynasty, and At the time, Hicksos's "Hands-over" activity was in the palace. Finally, the palms of these enemies are all buried in the king's palace. Although it is not yet possible to confirm when such a terrible tradition began to rise, Bietak affirmed that every pit excavated represents a â€œhands-overâ€ ceremony, meaning The soldiers took the enemy's palms to attend certain activities. Leaders on the spot rewarded gold and buried palms in the soil. Some news or information of the gold exploration network () is collected by the online search. Copyright of the work is owned by the original author. If you infringe your rights, please leave a message and inform the gold customer service. We will delete it in time. If someone uses it for business purposes If you infringe on the interests of the original author, the consequences are your own. If personal information is involved in the article data, we will delete it at the first time after receiving this notice. Previous Post: What should you watch out for when installing a lightning arrester? Next Post: I am afraid that the confiscation of passengers by the security check at Qingdao airport actually hides the blade in the computer.